Tuna and veggies - just 2 ingredients, just 2 minutes, dinner is served! Kirby loves fish which is a good thing since tuna is low in fat and calories and packed with lean protein, vitamins B and D, and omega-3 fatty acids. Of course all Kirby cares about is that it tastes good. I wanted to make Kirby a special new treat since he would be boarding for the first time over the next few days. Searching my pantry I discovered I was out of quite a few ingredients. Message to self - take a trip to to the grocery store soon. Since I didn't have time to run to the grocery store I thought I would improvise with what I had and hope for the best. Fortunately Kirby gave it four paws up! Seriously I think there's a cat inside that dogger! 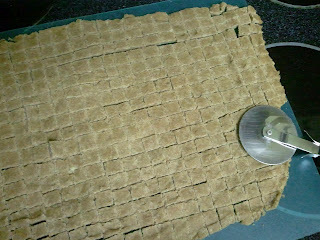 A can of tuna in the cabinet is the beginning of a delish dog treat! Drain the tuna, saving the liquid. Puree the tuna with the oil. Take the saved liquid and add enough water to make 1/2 cup. Thoroughly combine all of the ingredients in a medium bowl. 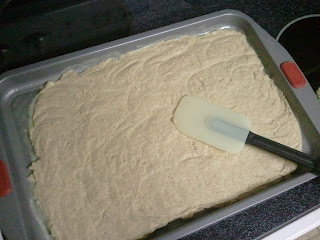 Using a spatula spread out the mixture on a greased or parchment lined jelly roll pan. (If you really want to cut cookie shapes then you can reduce or omit the water or add more flour until you have a better consistency to work with) . Bake at 350 degrees for 20 minutes. Turn off the oven and let sit for another 20 minutes with the door slightly ajar. Remove to cutting board. Slice into small pieces using pizza cutter. These can keep in an air tight container in the refrigerator for several weeks. * You can substitute light olive oil or coconut oil. I like to add salmon oil to Kirby's dry kibble - it's great for his skin and coat. 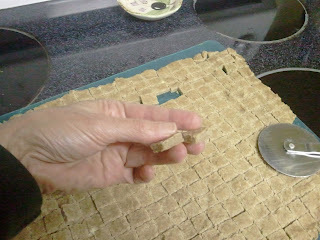 ** You can use brown rice flour or whole wheat flour. Spelt which has a mild nutty flavor is naturally high in fiber, contains significantly more protein than wheat, is also higher in B complex vitamins, and both simple and complex carbohydrates. Another important benefit is that some gluten-sensitive people have been able to include spelt-based foods in their diets. Flour made from this versatile grain can be substituted for wheat flour in breads, pasta, cookies, crackers, cakes, muffins, pancakes and waffles. Have a hungry traveler and you find your out of dog food? Well this has happened to us but I have an easy, quick solution to please the finickiest eater. It’s quick, easy and most everyone should have these items in their refrigerator. You can use tuna packed in oil but I prefer olive oil or salmon oil over vegetable oils. You can also reduce the amount of oil used, just remember how good it is for itchy skin and dry coats. This recipe is quite adaptable to changes - use chicken or beef in place of the tuna, use cheddar cheese or feta cheese in place of the cottage cheese. Trust me - they'll be begging for seconds! This quick recipe comes in handy when away from home since most people have these items in their refrigerator. Heat the olive oil in a small pan over low heat. Cook the eggs working them with a spatula. Add in the tuna, cottage cheese, and egg shell stirring until heated through. Remove pan from stove top and let cool before serving.